Epidural needle insertions and facet joint injections play an important role in spine anaesthesia. The main challenge of safe needle insertion is the deep location of the target, resulting in a narrow and small insertion channel close to sensitive anatomy. 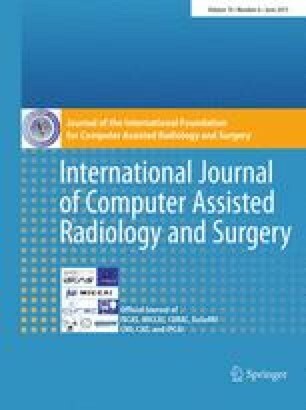 Recent approaches utilizing ultrasound (US) as a low-cost and widely available guiding modality are promising but have yet to become routinely used in clinical practice due to the difficulty in interpreting US images, their limited view of the internal anatomy of the spine, and/or inclusion of cost-intensive tracking hardware which impacts the clinical workflow. We propose a novel guidance system for spine anaesthesia. An efficient implementation allows us to continuously align and overlay a statistical model of the lumbar spine on the live 3D US stream without making use of additional tracking hardware. The system is evaluated in vivo on 12 volunteers. The in vivo study showed that the anatomical features of the epidural space and the facet joints could be continuously located, at a volume rate of 0.5 Hz, within an accuracy of 3 and 7 mm, respectively. A novel guidance system for spine anaesthesia has been presented which augments a live 3D US stream with detailed anatomical information of the spine. Results from an in vivo study indicate that the proposed system has potential for assisting the physician in quickly finding the target structure and planning a safe insertion trajectory in the spine. This work was supported in part by the Natural Sciences and Engineering Research Council (NSERC) and in part by the Canadian Institutes of Health Research (CIHR).